One of the greatest things about mixed breeds is that two excellent dogs combine into one delightful companion. This is undoubtedly true for the Border Collie Lab Mix, which combines two of America’s most beloved dogs. Also called the Borador, Border-Bor, or the Labrador-ador, this breed makes a fantastic friend for first-time owners. Learn what makes these pups so great below. How Big Does the Border Collie Lab Mix Get? Do Lab Collie Mixes Shed? How Long Do Border Collie Lab Mixes Live For? 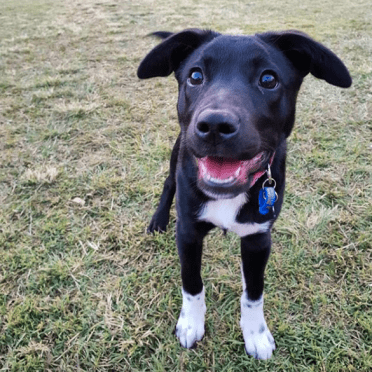 How Much Does a Border Collie Lab Mix Cost? Conclusion: Is the Lab Collie Mix Right For You? Mixed breeding has been around for a while. Since dogs were first introduced into society, people have been creating new breeds for many reasons. Such examples include breeding a new to become a better hunter or to create a more hypoallergenic coat. However, creating Designer Dog breeds such as the Border Collie Lab Mix began at the start of the 21st century. In fact, the Borador came to North American in the past 10 to 20 years. So it’s a relatively new mix. The American Canine Hybrid Club, the International Designer Canine Registry, the Dog Registry Of America, the Designer Dog Kennel Club, and the Designer Breed Registry all recognize this dog breed. These dogs make fantastic family members, hunting dogs, aids to police officers, and therapy dogs to those in need. That’s what happens when you combine the incredible intelligence of a herding dog with the companionship of America’s most popular dog breed. Some references trace this breed all the way back to the 19th century. They originated in the United Kingdom as herders and guard dogs for sheep. Many farmers still use these dogs to aid them in their work, and they’re still the top herding dog today. Their unrelenting work ethic makes them great at their jobs. Combine this personality trait with their sharp minds, it’s no wonder Border Collie owners must keep their dogs stimulated. Otherwise, destruction and misbehaviors are sure to follow. Despite this, they are still very loving and family orientated. Don’t be surprised if your Border Collie is as close to you as your shadow. They come in a variety of colors, though the most common is black and white. Their fur is long and soft to the touch, and they can way anywhere between 30 to 50 pounds (13 to 23 kgs). The Labrador Retriever originated off the coast of Newfoundland. Breeders initially created them to become smaller versions of Newfoundlands. 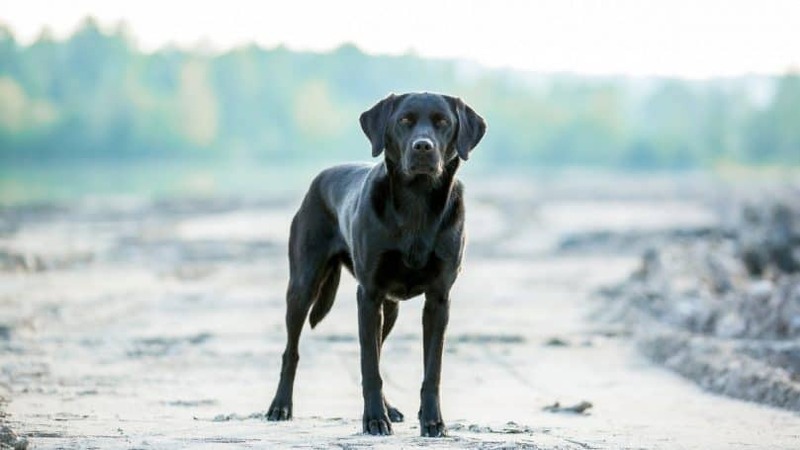 They helped to retrieve fish for fisherman, and many labs came from a single dog born in 1885. They came to America in the 1920’s and exploded into one of the most popular dogs in the world. This is due to their gentleness and loving nature. They’re great pets for all family members, from other pets to smaller children. Labs are also brilliant, making training a breeze. These dogs are large-sized, have short hair, and come in three different classic colors, you might already be familiar with, black, yellow, and brown. So how do the Border Collie and the Lab combine to make the Border Collie Lab Mix? Adorably, that’s how! Black and white coloring, with white patches covering the face and neck. 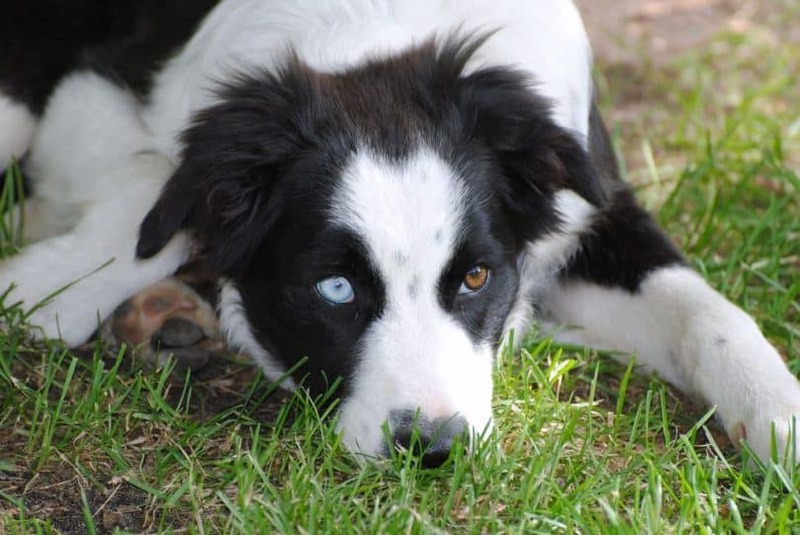 Thanks to this mixture of traits, the Border Collie Lab Mix is a beautiful and adorable dog. The Borador will fall somewhere in between its parents in size. The Border Collie’s height ranges between 18 to 22 inches (45 – 55 cm), while a Labrador Retriever’s height comes to about 21. 5 to 24. 5 inches (54.6 – 62.2 cm). The Border Collie Lab Mix size comes at around 15 – 17 inches tall (38 – 43 cm). The Lab weighs between 55 to 75 pounds (25 -34 kg), while the Border Collie ranges between 30 to 45 pounds (14 – 20 kg). The Border Collie Lab mix weighs around 35 to 50 pounds (16 – 23 kg). Borador females tend to weigh lighter than the males. Either way, you’ll find yourself with a medium-sized dog perfect for cuddling and enjoying playtime. The Borador inherited the same intelligence of the Border Collie and the Lab. In fact, the Lab Collie mix is often described as having the same mental ability as a 2 and half-year-old child. These dogs are also kind and happy. They make fantastic family dogs thanks to their ability to get along with kids of all ages and other pets in the household. In fact, these dogs are perfect for those who already own dogs as they love to be a part of the pack. They are barkers and tend to get very excited. This means lots of jumping and licking, which can end up hurting if not trained. But they mean well! Lab Collie mixes need lots of training and mental stimulation to remain happy pups. If not, they can become bored and even destructive. Do your furniture and yourself a favor and get to training. The good news is they are extremely easy to train thanks to their intelligence and eagerness to please owners. Since they can sometimes be stubborn too, use a gentle yet firm hand with training. No harsh punishments, but don’t let them dedicate how training sessions will go. Training can also help with any anxiety issues they may have from being separated from you. It also may help them calm down their chewing instincts. Make sure to give them lots of chew toys! They also make fantastic agility competitors, like Border Collies. These dogs need lots of exercises. While they aren’t as energized as Border Collies thanks to the Lab part of the mix, simple evening walks won’t cut it for the Border Collie Lab Mix. Plan to schedule several hours of play time a day. 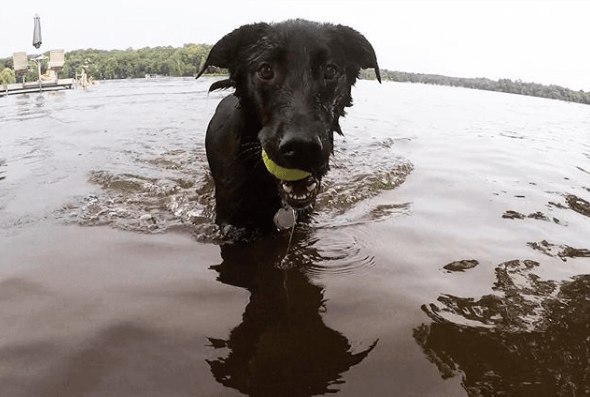 Hikes, long runs, play time in lakes, and other outdoor activities will make these dogs extremely happy. Not only is it great for your dog, but for you too! These dogs will undoubtedly help keep you in shape. If you work a 9-5 office job, the Borador may not be the best fit for you. Otherwise, you’ll have a destructive and depressed dog on your hands. As well, these dogs need a home complete with a large backyard to run around in. No apartments for the Border Collie Lab Mix. These dogs have shorter hair than Border Collies, so you don’t have to worry about brushing them every day. Instead, plan to groom your Border Collie Lab Mix once or twice a week with a bristle or pin brush. Slicker brushes are excellent at removing any mats that might build up with all that play time. As well, since they are adventurous dogs, they will need baths every 1-2 weeks. Aside from taking care of their fur, make sure to check on your Borador’s teeth, nails, and ears regularly. Especially since they are prone to ear infections, they’ll need to have their ears cleaned weekly. Brushing their teeth and trimming their nails regularly also helps to fight against common health problems. Since their fur is not as long as the Border Collie, the Borador doesn’t shed as much. However, there still will be some shedding, so plan for that. They are not a hypoallergenic breed. Encourage your Collie Lab Mix to eat slower. This might require training, but it will help prevent any bloating issues this breed can have. As well, be careful to measure out their food and not give them anything in addition. These dogs are known to overeat. Since the Borador is a mix breed, they could potentially run into fewer problems than if they were a purebred dog. Sometimes this isn’t true though, so consider running genetic tests on your dog to see if they run a high risk for any health issues. Here are a few medical conditions they could inherit from their parents. 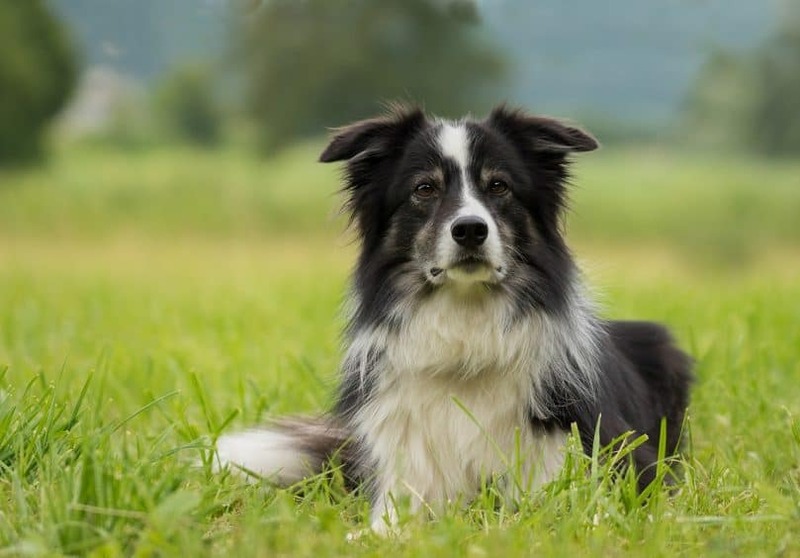 The Border Collie runs into only a few potential health problems. The first is congenital deafness. This happens when the ear does not get the blood flow it needs. It’s most common in dogs with white heads and blue eyes. Border Collies also have issues with elbow dysplasia. This is a medical condition caused by the abnormal growth of cells, tissues, or the bone. It can eventually lead to lameness, and it’s common in medium to large sized dogs. It possible that the Border Collie Lab Mix could run into these issues. Take your dog to regular checkups to spot any medical problems before they rise into bigger issues. The Labrador Retriever has a few medical problems worth discussing. Labs have poor joint formation, which can lead to more significant problems like hip dysplasia, elbow dysplasia, osteochondritis, knee dislocation, and general arthritis. These issues can later lead to lameness and difficulty walking. As well, Labs can run into eye problems like cataracts. They also have heart problems like a poor formation of heart valves, which can become a serious issue if not spotted early enough. Like with the Border Collie issues, Boradors could also have any of those issues. Again, regular check-ups are essential for a happy and healthy pup! The good news is that if treated well, the Borador can live up to 13 years! 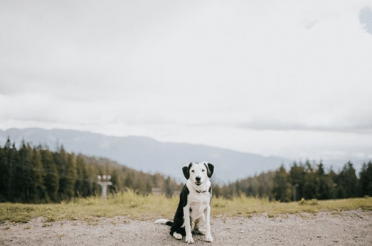 Mix breeds tend to live longer than their purebred parents, so get ready to enjoy more than a decade of adventure and laughs with your Labrador Collie Mix. If you’re ready to bring an adorable Collie Lab mix puppy into your home, there are lots of places to choose from. Breeders are all across the country, but make sure to do your research before choosing. Make sure buy from a breeder who can ensure they won’t pass any health issues down to the pups. You can ask for DNA tests to ensure this doesn’t happen. As well, rescuing is another fantastic option! Mix Breeds are common to find in most adoption agencies. You might be wondering if the Borador is an expensive mix breed, but this is not the case. These dogs can run from $200 to $500, depending on which breeder you buy from. The Border Collie Lab mix is a wonderful cross-breed that combines two of the most popular dogs in the world. If you’re looking for an adventure-loving, intelligent, and fantastic family dog, then look no further than the Borador. Let us know what you think of this breed in the comments down below!